Charles Werner’s “Hope at Last” cartoon from 1935. Images courtesy the Old State Capitol. One thing that might strike you about editorial cartoons from the early 1900s: We’re having many of the same debates today. Concerns about getting involved in international conflict, worries that we’re not taking care of veterans, annoyance at the president’s frequent vacations and even our fascination with British royalty—those topics were all part of the public discourse at the start of the 20th century, too. The exhibit “Lines with Power and Purpose” at the Old State Capitol features more than 50 original editorial cartoons from the 1900s to 1930s, offering a glimpse at how comic satire in major newspapers reflected the times and also changed public sentiment. And turbulent times they were. World War I, the Roaring ’20s, the Great Depression and World War II all provided fodder for editorial cartoonists. One such cartoon, by Michigan-born Ding Darling in 1939, responded to the news of Nazi Germany’s invasion of Poland, which ushered in the beginning of World War II. It depicts European families donning gas masks and rushing to bomb shelters at the sight of an ominous shadow. Titled “Every Day is Ground-Hog’s Day in Europe,” it was reprinted around the country and seemed to convey the dread Americans were feeling. 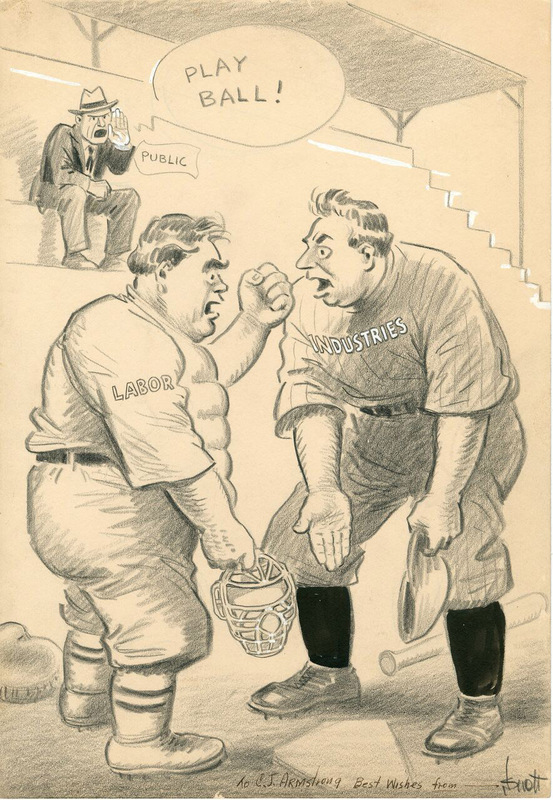 John Francis Knott’s “Play Ball” cartoon from 1937, published in the wake of protests over labor laws and unionization. You can also see the progression of styles over time. The early 1900s cartoons depicted more realistic figures and detail. Those toward the mid-20th century offered the cartoony caricatures of politicians we’ve come to expect, all goofy poses and exaggerated expressions—possibly a sign of the dissatisfaction Americans were feeling about political leaders. 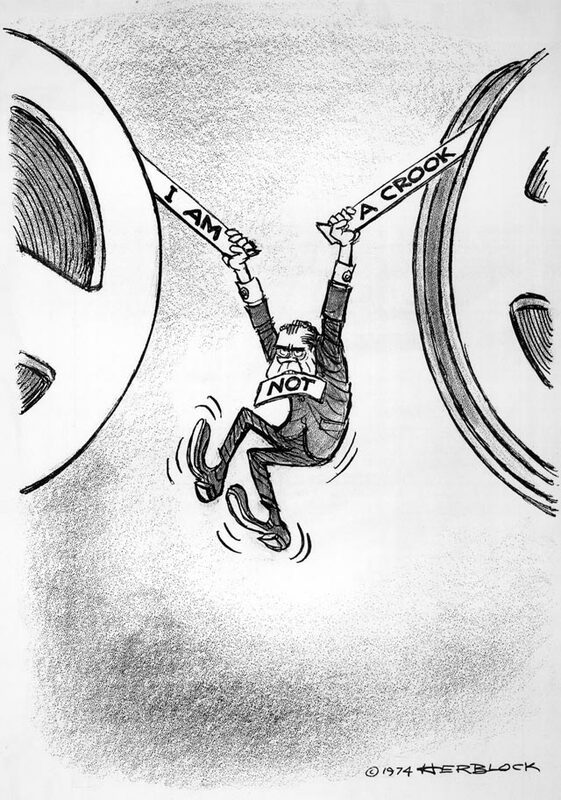 One of Herb Block’s cartoons critical of Richard Nixon. Sept. 7: Editorial cartoonist Fred Mulhearn will sign copies of his new book, Looziana Political Cartoons: The Best of Fred Mulhearn.